Anybody can build wooden steps, but having a set of brick steps sets you apart from the crowd. 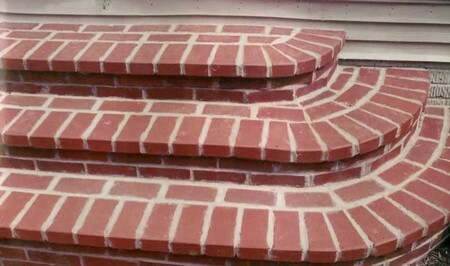 It’s even more impressive when admirers find out you actually know how to build a brick steps on your own. This project can be time-consuming, but the satisfaction you get from far outweighs the disappointment of any mistakes you made earlier. The foundation is an extremely important aspect of your steps. You have to remember that steps take on a lot of weight and pressure daily. 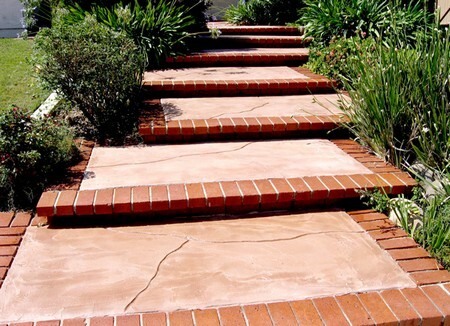 A solid cement foundation is essential to the longevity of your steps. Excavate the area so that the earth is exposed; use a spirit level to ensure the surface is perfectly level. Compact the soil if needed, and make a record of the dimensions of the steps, i.e. its height and width. This is so that you have an idea of how many bricks you need to complete the project. You will first need to construct a framing box from 2″ x 6″ lumber before you pour in the cement. The cement should be mixed according to the instructions given and poured into the box to a depth of 6 inches. Rebar should be laid in a crisscross pattern into the cement as it dries to provide more stability and strength. It is recommended that the bricks be wet thoroughly, up to a day, prior to use. This can be carried out several hours before work begins on how to build a brick steps so that the dry bricks don’t absorb moisture from the unset mortar. The bricks that form the interior, or frame, of the steps remain unseen when work is complete, therefore they can comprise larger, more inexpensive bricks. The first row, or course, of bricks should be laid with an inch of mortar between each brick. It is important for the first course to be level before subsequent ones are added. Each step should have a rise of 6 inches and a tread of 21.5 inches for a comfortable fit. Don’t forget to make space allowances for the width of the facing, or exterior, bricks. Facing bricks are applied once the interior brick frame is completed. Portland cement, and not builders’ cement, should be used for the face bricks as it is more resistant to adverse weather conditions and water erosion. Including a slight pitch (up to an inch) in the tread when building your brick steps allows water to flow off the steps and prevent puddles or ice patches which can lead to slippage and accidents. Uniform riser heights can be achieved by laying the bricks on their sides when building them. Be sure to clean up your work area after completing the steps so that it is clear of spilled cement or brick splinters.